"Morning Mr. Magpie" kicks in with just as much fury as "Bloom" left off with, but this one feels a little more like running through the rain in Neo-Tokyo at night. This track probably would have been way over-produced if it had been on any previous albums, but there's a sparseness and simplicity to it here that is essential to it sounding as enormous as it does. "Little by Little" is much gentler, but just as driven as the first cuts. An eerie melody rounds it out in a way that makes it sound like something left off of Hail to the Thief, but it falls clearly into the rhythm assault that perpetuates through The King's first 20 minutes. "Feral" is nearly an instrumental continuation of the same groove, but the bass line is far more threatening -- especially with the echoes of Yorkian radio messages lost in the temporal field quivering over top. At this point on the record, drummer Philip Selway has been given control of the band, and the four melody-based songs that follow act as a direct release to the relentless motion he created in the first four. "Lotus Flower" is definitely the closest thing to a single, and features classic jumbled lines of uncertainty: "Just to see what if/Just to see what is." The dubbed out vocals have somehow found a way to not sound cliché, and rather the reverb is ideal. "Codex" is the essential slow, piano track that always finds its way into the mix, and sounds like the sister track to 2007's "Videotape." Yorke had been performing "Give Up the Ghost" frequently at his solo performances last year, and the version here doesn't seem to do justice to the creepy solitude he was able to convey in his live acts. They don't give it enough room to breathe, yet un-comparing ears will hear it breathe just fine. "Separator," the closer, drifts out as casually as it drifts in, and emotes a sense of being intentionally non-epic. It feels much more like a halfway point than an ending. Leaving things more open-ended than ever before, for the first time a Radiohead album creates an instant desire for more, rather than the craving to return and dig deeper. Perhaps the superficiality of it is all part of the plan, or perhaps I'm blind to the hidden puzzle, but it seems like the band wanted to finally make an album that could slip past some radars. All heroes, all magicians, and most importantly all bands need to have moments of clarity -- when they can remind themselves that no matter what the world believes they are still but men, and still just a band. You should be able to see yourself in the people you believe in, and your heroes need to see themselves in you as well. 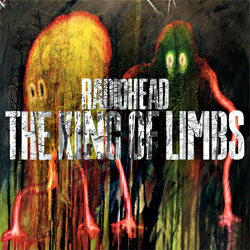 Perhaps the title, The King of Limbs, refers to a master of extension -- to a band that knows how to draw its fans into the process of growth along with them. But if you go deep with this band, there is a justified love that is reciprocated in every second of their music -- including this album, and including whatever is next to come.